Cinemagraphic Writing « Cinemagraphic Writing: the art of writing stories like movies in the mind. On Facebook, a lot of authors host Book Launch Parties to celebrate the release of their new books. These launch parties can be an all-day event of the author talking about their book, answering questions, and giving tons of tips, or it can be just whatever the author wants. What happens most of the time is that the author will invite other authors to come and take an hour of the event to promote their own work. This is called an Author Takeover Event, and the event can be anywhere from one to three days long. Author Takeover Events are helpful because every author involved already has their own platform and loyal fans who jump at the opportunity to see one of their favorite authors participating in such an event. Also the fans may be curious as to meet new undiscovered authors in the same genre. So this works in favor for everyone. So what do you, as an author, do in such an event? You usually have one hour to talk about yourself/your book. Sometimes two hours, but usually it’s just one. That may seem like a LONG time, but really it’s not. Let me break it down for you. An hour is 60 minutes. 12 x 5 = 60, so you can post every five minutes which results in a total of twelve posts. Five minutes feels like a long time, but it’s just enough for people to Like/Comment on the posts without being TOO long a wait. I will break that down. As you noticed Posts 1-9 have no description. These are the posts you need to get creative about. So really, instead of TWELVE posts that you need to worry about making up, you need to just worry about NINE. The two intros and the conclusion tend stay pretty consistent although you can change them up however often you want. Just depends on how often you participate in these events. However, it’s the seven posts in the middle that you need to focus on. There really isn’t limit to what you can do. Be creative, professional, organized, and engaged with the audience, and you can do whatever you want. It’s an opportunity for you to talk about YOUR BOOK for one hour!! That doesn’t happen a lot, so seize the opportunity. Now though, when you participate in an Author Takeover Event, things can get crazy pretty fast, so you may want to be organized beforehand before diving into it. You see, what happens is that you make a post and publish it, and you plan to wait a few minutes before publishing another post. However, after you post something new, someone may comment on your previous post. You turn your attention to it to reply, and someone else comments too. Next thing you know, you only posted one thing and fifteen minutes have passed, and people are wondering if you’re going to post anything else. 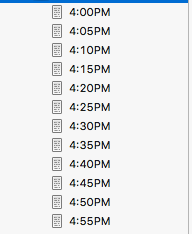 As you can see, each document is labeled according to a specific time. This is because for that specific Author Takeover Event, my slot is from 4-5PM CST. Instead of me trying to mentally multiple by 5 during the event, I just titled each post with the time I want to publish them. This is one less thing I have to worry about later. Here’s another organizational trick I do to keep up with my posts and everyone’s comments. As soon as I publish a new post, I go to the time stamp right beneath my name on the Facebook post, and I right-click then ’Open In New Tab’. This opens that specific post in a new tab. When I post another one, I do the same thing, opening a separate tab for it as well, and I keep doing it. This way, when I get a notification of comment, I can check the notifications to determine which post it is, and then go to the tab that contains that post rather than scrolling up and down trying to find the right post. I have one main tab open, which is where I publish each new post. I don’t change anything with this tab. As soon as I publish a post, I open a new tab with that post then ignore that tab. I then go to my notes, copy the next post, and go to the main tab, paste the post there, and have it all primed and ready to go when it’s time to post. Once I’ve done that, I can skip around the different tabs I have opened and converse with everyone without missing a beat. Hopefully that makes sense! Sometimes it’s hard to describe these things! Now remember, all of these are merely recommendations. Everyone does everything differently. There is no right or wrong way to do it. If you’ve never done an Author Takeover Event, this is simply a guideline you may follow. Adapt and adjust it according to your own preferences. Pay attention to any rules the MAIN host of the event may have. Be professional but also approachable. And most of all have fun! I hope you the best! And the list can go on. Now, there is no magic formula how to not procrastinate. Everyone is different, and there is different ways to combat this. Some people are more self-motivated while other people really struggle to get much done. You need to determine what kind of person you are and what your unique struggles are. If you realize you lack self-motivation but really want to change that, you need to start setting realistic goals for yourself. Let’s say you struggle with writing anything in your story, but you want to get better at that. Start by telling yourself to write at least 250-500 words a day. You have no excuses. You can do it. You simply need to make the time to do that. You can ask a friend to hold you accountable, but you don’t want to rely on that individual. You must become independent and self-driven. As you do this, you will find that this new drive doesn’t only affect how you write, but it also touches upon the rest of your life and how you conduct yourself. You see, it takes time to get something time. If you can measure how much time each project takes, you can manage it accordingly. People have lost the sense of being accountable for how they spend their time. If you’re trying to become more self-motivated, start observing how you spend your time. One way to do this is to take a calendar at the end of the day and write the major things you accomplished during that day or what major things happened to you during that day. Having a blank day makes you feel like you totally wasted all that time, which cannot be redeemed. Of course that’s not including the everyday chores I have to do. These are things totally within the realm of possibility. Yes, the proofing and editing of fifteen chapters can be daunting, and I’m really not looking forward to that, but I did the math. If I do 15 chapters a day, I will have completed the book by Saturday. Once it’s completed, I can send it on to my proofreader and to my editor, and they can begin the process of proofing and editing it themselves. The sooner they get it, the sooner they’ll get it back to me, and the sooner I can publish it. That is the only thing pushing me. I’ve already completed #3 on that list, and I’m currently working on #1. Around 3PM today, I’ll be able to hit the gym. And that is how I’m able to accomplish things on my To-Do list. I don’t list every little thing I need to do (like cooking dinner or cleaning out the cat litter box or feeding the dog), but I list the things that I’d like to accomplish during the day. So, as you contemplate procrastination, reflect on your life, your motives, and what motivates you. I can’t give you a checklist that will make you more productive. I can’t change who you are—only you can do that, but you can only do that once you realize who you really are, and that takes some self-reflection and being honest with yourself. The truth about self-publishing is simple: it’s hard work, and it can cost a lot of money. What’s the advantage? You, the author, maintains absolute control over every element of your story, book, and marketing. If you know what you’re doing, this is a good thing. If you don’t know what you’re doing, this can be overwhelming but not impossible. Let’s break it down. The first two parts you do on your own, and #2 you might do multiple times. Once you’ve done that, then do #3 on your own, and again you might do this multiple times before moving on to #4 where you allow other people to read it and give you feedback. Once you get that feedback, you go back into the story, revise and self-edit accordingly, and then you send it on to an editor who checks for any errors. Once you’ve fixed your manuscript based on what they found, you send it to a proofreader, who looks for anything out of place. When that is done and you have once more edited your novel, you can begin the formatting process or you can send it to someone to format for you. Around the same time, you’d want to contact your graphic artist to begin a cover for your book. Once the book is formatted and the cover is completed, you are ready to send it to whichever self-publishing venue you wish. And then the promotional stage really kicks off although even before this, you should have already begun building your fanbase through Author Facebook Page and any other social media means you wish to use. You can find more of that topic in the post discussing ‘The Etiquette to Self-Promotion’. Publish: free-$$$$, depending on the publisher you use. Kindle Direct is free. Draft2Digital is free, CreateSpace is free although it is about $10 for a proof of your book, which you look over for any errors before publication. WARNING: avoid any publisher that requires you pay a few hundred or a few thousand dollars for them to publish it. You will not have absolute control over your book. They may offer to help you promote it, but usually it’s not worth it. Promote: free-$$$$, depending on what you use. Word-of-mouth is free. Posting on Facebook and Twitter and on your blog and website is all free. Using Thunderclap and HeadTalker campaigns are free. Paying for ads on Facebook or Twitter costs. Some sites will promote your book (especially if it’s at a discounted price lis $0.99 or free) for anything from $5 to $15 all the way up to $200—depending on which site you use and which package you use. Other sites can cost up to $3,000 or so because they take promotions to a much bigger level. I wouldn’t recommend those unless your budget can handle that expense. Reviewers: free—$$. First, let’s note that you should never pay someone to leave a review. Never buy reviews! Why does it cost at all then? It’s simple really, but let me explain why it could be free first. If friends or family agree to review the book for you, you can send them a free copy of your ebook. This is entirely free but with the understanding that they will leave a review. If you have to send them a copy of your book, there is the cost of shipping to take into consideration, which can be about $3-$20, depending on where you’re sending it. Now, some sites offer review services, and they charge about $15-$40 depending on the package you get. However, with this, you must understand, you are not paying the reviewers for their reviews. You are paying the business, which has bought together and organized all these reviewers and will send your book to them instead of you having to do it all yourself, for the service. There is a difference. Please keep that in mind. You want honest reviews. If you pay for reviews and the person doesn’t even read the book, Amazon can crack down on that, and that will have dire consequences for you. Copies of Your Book: $10-$$$ This depends on how many pages your book is and how many books you purchase in a bulk. You will get an author discount, but then there is shipping as well. All of this are expenses to keep in mind. Author Swag/Merchandise: $5-$$$ Bookmarks, business cards, magnets, keychains, charms, gift cards, pens, notebooks—basically anything you sell or give away in order to draw more interest to your book. The big secret is, as a self-published author, if you want any swag made, you need to put in the time and money to have it made. You can use sites such as Vistaprint for bookmarks, business cards, and a few other stuff, but then you can check out Fiverr or Etsy for unique ideas. All of this is more money out of pocket. Of course none of this mentions the expense of travel should you decide to do a book tour or attend conventions in order to sell your book. Publishing and selling a book can become quite expensive, but this is why it is important to budget. If you have a good handle on the finances, you will come to see what works for you and what doesn’t, and when it’s time to promote again, you can put into action only what you have determined benefited you. Fan fiction is a controversial topic. Some people say are totally against it while others are absolutely for it. Let’s first identify what fan fiction is. When someone creates a piece of fiction, if a person takes that work and writes something based off it (keeping the names of characters, locations, and events), this is fan fiction. It could be set in an AU (Alternative Universe, which means the events of the canon story either didn’t take place or had different outcomes), and it could include OC (Original Characters—creations of the fan fiction author). These stories are written in the universe of the original story. If you’re a Star Wars fan, and you wished Obi-Wan Kenobi and Padme got married instead, that would be a fan fiction story in the Star Wars universe. If you wanted to find out what was meant when Black Widow said, “It’s like Budapest all over again,” and Hawkeye responded, “You and I remember Budapest very differently,” you could write an Avenger fan fic based on that to explore it. What’s the catch? You cannot sell this work or attempt to profit off of it. Since you do not own the rights of the original story, you can’t do that. However, you can post it on sites like www.fanfiction.net or so forth. When you do this, fans of the original story will see it, read it, and likely comment. This feedback is useful for your journey into becoming a writer and helps you hone your skills. One of the issues about writing your own original story as the first full-length novel you ever write is you may not know how to develop characters well, you might not have a full handle on description or scene setting or dialogue, and on top of that you have to create an entire world. If you’ve never done that before, it can be daunting. This makes writing your own novel all the more difficult. If you write fan fiction first, you don’t have to worry about creating whole new worlds or characters. It’s like a pre-set story for you to just fill in the blank and twist however you want. You already know the characters because of the story/book/film/show, and you can readily imagine them in your mind. You already have an understanding of their world, so it’s easy to grasp. You won’t have to worry about all those fundamentals of a story while you’re trying to learn your own writing style. The foundation is already there. All you need to worry about is perfecting the specific elements (character development, dialogue, description, plot structure, etc). The more you write, the more you’ll start flexing your writing muscles. It’ll likely start with you taking the characters to unfamiliar places, and this gives you the chance to create an original setting in a safe environment. As this becomes easy, you begin introducing more major original characters into the cast. Eventually those original characters completely replace the fan fiction characters, and as you add more twists and turns and get further and further from the original source of the story, you’ll realize you have something that’s totally different from the original story. This is where you can begin writing your own original story. When this happens, you won’t be so stressed out about all the different elements of writing because you already have a good handle on them. Instead, you can press on and write your own original piece of fiction, and you have a good chance of publishing it. Consider fan fiction the playground or training arena for writing. You can’t sell the work, so you don’t have to worry about promoting it. Instead, you are writing it for you (and maybe a few fans you pick up along the way). You are growing as a writer, and you learn so many lessons in a safe environment. Once you start breaking the mold and flexing your writing muscles as creating your own worlds, the world becomes a scary place, but you’re ready for it. This is why I recommend writing fan fiction if you’re a beginning writer. Of course, some people may view it a waste of time, and I understand that. However, if you’re struggling with writing, writing fan fiction is an option you have and should consider. A lot of writers ask, “Should I keep this chapter or not?” and “How long should chapters be?” However, before I address those questions, let’s identify what exactly chapters are, and this will help us answer those questions. Scene: is contained within a chapter. You cannot have multiple chapters in a single scene. Chapter: separated by titles such as ‘Chapter 1’, ‘Chapter One’, etc. These differences may not seem like much, but I don’t want you to be confused by the terminology. Scenes aren’t usually an issue, but they are part of a chapter, so I mentioned them. Our primary focus is on chapters, so let’s discuss some questions that accompany that. How long should a chapter be? This is a common question, but, as it always is with writing, there is no written rule for the length of chapters. It is recommended for chapters to be more than a few paragraphs long—at the very least a page long or 1,000 words long. As for now long it should be, chapters can sometimes go up to 6,000-8,000 words long. However, the longer you make the chapter, the more you run the risk of losing your readers. How do you know when you should end the chapter? This is when knowing the point of the chapter is important. Each chapter moves the story along. If you could remove the chapter (or even the scene) from the story, and this does not affect the story at all, that chapter is unnecessary. If the chapter has already accomplished its purpose yet you keep writing more and more and more, you may want to consider looking for a natural breaking point in order to end the chapter and begin a new one. Otherwise it can be longwinded and a huge distraction from the rest of the story. So, as you’re writing a chapter and if you see it’s becoming lengthy, ask yourself what is the purpose of the chapter, and have you already accomplished it? If the chapter hasn’t done what you intended for it to do, step back and determine what’s getting in the way (it could be that the story wants to go a direction different than you planned). If you find a lot of meaningless though fun conversation between characters, consider cutting back on that and getting to the point. Or it could simply be that’s how the chapter is supposed to play out. One last thing I will say on the topic of chapters is this: if the main purpose of the chapter is character development, this is a weak purpose. I once attended a workshop taught by a screenwriting agent, and he said if a scene in a script was only about character development, they would cut that scene altogether. This applies to stories as well. Characters are developed through conflict and whatever it is they encounter. Merely introducing two characters and having them sit down and chat for the sake of backstory isn’t the reason for a chapter. Yes, that backstory may be important, but you can hold off on revealing vital information until it is absolutely necessary. One way to do this is to get your characters into a situation where they naturally ask the questions the readers are asking. For instance, let’s say you have a character, Eleanor, who’s adopted, and she suspects it’s her adopted brother who’s behind the recent attacks in town although she has no way to prove this yet, and she knows she can’t say anything because people in the town are very loyal to him. If she’s right, and if he gets winds of it, she might be his next target. So you, as the writer, knows this, but the readers don’t know this yet, and neither do the other characters. But you introduce a new character, Hector, a detective who’s investigating the attacks. Eleanor has been tagging along with his investigations, claiming to be a reporter (maybe she actually is), and she ends up being helpful, so Hector ignores her but lets her in on the case. Then one evening, they’re sitting at a bar, sharing drinks. Not much is happening, so they’re just talking. Someone who wants mere character development as the plot for the chapter might have Hector ask Eleanor about her background and her family, and Eleanor would just spill all the info. However, Hector doesn’t know that he should be curious about her family. He doesn’t know that’s where he should dig. He’d likely just ask what her job is, might ask about her family, but Eleanor would likely skirt the issue. This makes things intriguing. If the readers know about Eleanor’s suspicion of her adoptive brother, they would be yelling at Hector to ask about her brother, and they’d get frustrated when he moves on with the conversation to another topic, but you have to understand, he doesn’t know. You have to keep the conversation natural for him. If the readers don’t know about her suspicions, they’d likely suspect something as well but wouldn’t know where to dig either, so they’d go along with it. As you can see, this conversation cannot be the main point of the chapter. Yes, it’s good information, but it can be very shallow. There needs to be something that happens that pushes the story forward. It could be that in that moment Eleanor’s adoptive brother, Ryan, walks into the bar, and the entire atmosphere changes. He could approach them, tease her like brothers do, but then he could say something that’s a veiled threat. Eleanor would get the message immediately, but Hector wouldn’t completely understand though he’s wary of something. As soon as Ryan leaves, Eleanor could make an excuse saying she forgot she had to be somewhere, and before Hector can stop her, she’s out the door. A moment later Hector just can’t shake a bad feeling, so he follows after her, and who knows what happens after that? You see how that one moment pushed the story forward because without Ryan stepping in and prompting that response from her, the story wouldn’t have moved forward. This is what I mean when I say that you need to make sure each of your chapters have a purpose to them. Thunderclap is a promotional opportunity not limited to writers but can be for events, artists of all kinds, and anything really where you need to get word out. There are different packages offered, but the basic one is free, so it is no cost for you or anyone who supports you, but what exactly is Thunderclap? Before I explain what Thunderclap is, let me illustrate what social media is. The internet is full of noise of people posting about every detail of their lives and every thought they have. It’s a loud and noisy place. It’s really hard to get word out. I often compare it to being in a crowd and saying something. You can yell all you want, but if you’re the only one saying whatever it is you’re saying, no one is going to hear you. Sure, some might notice your attempt and look at you strangely, but they’re not quite sure what it is you said because of all the noise of the crowd. However, if a bunch of people start saying the same thing, people take notice. This is where Thunderclap comes in. James’s social reach is 489 people. Kasey’s social reach is 952 people. Now, Hannah is the creator of the campaign, and her social reach is 692. She is friends with James, Kasey, Nathan, and Sandra, and when Hannah begins a Thunderclap campaign, all four of those support her campaign. This gives her a social reach of 4,658—a number she wouldn’t have had if it wasn’t for everyone’s support. When you create a Thunderclap campaign, you have to choose the number of supporters required in order for the campaign to be launched. You also set the date by which you must have that number (or not) for it to be launched. The least amount of time recommended is two weeks. If you fail to get the number of supporters you chose within the timeframe that you chose, the campaign will not be launched at all. The least amount of supporters you can choose is 100. The next amount is 250. And it goes up from there. Now, how do you make a Thunderclap campaign successful so that you reach the number of supporters you need in order for the campaign to be launched? First off, share it with your family and friends and ask them if they’d support it. Don’t expect too many of them to do it because they’re unfamiliar with Thunderclap and may have some reservations, so you will need to look elsewhere. There are Thunderclap groups on Facebook that you can join and post your campaign there, but it’s a ‘clap for a clap’, meaning they’ll support yours if you support theirs. However, the most successful way I’ve found is to have a good support group around you prior to any promotions. For instance, I have a Facebook group of almost 500 people (at this time). They’re fans of mine, and they’re big supporters for what I do. When I discovered Thunderclap and created my own campaign, I shared it in that group, and I tagged a bunch of people I knew would back my campaign. Within 6 hours, I had reached my goal of 100 supporters for my campaign although I had a month before my campaign went life. Once you’ve reached your goal, you can overshoot it and continue getting more and more supporters. The main trick is informing people what Thunderclap actually is and asking for volunteers that you could tag when you want your campaign to be supported. Once you get a list of people, create your campaign then share it, tagging all those people who volunteered, and encourage them to share as well. You have to push this. You can’t just sit by and hope that someone notices. Social media is far too fluid, and posts sink into oblivion all the time. If you want it to work, you need to work it. Don’t wait for someone else to do it for you. When I’m pushing a Thunderclap campaign, I make it like a game or a sport. I aim for 10 supporters at a time, and each time we get more supporters, I announce it in the thread, “We’re at 45 now! We need 5 more to 50! We can do it! !” This gets people excited, and they want to be a part of the movement which makes it succeed. And that is what Thunderclap is, and it can be found here: www.thunderclap.it.